Air source heat pumps (ASHP) extract heat from the external ambient air and convert it into high grade heat to be used within the home. There is always heat energy in the atmosphere, even when temperatures are below O degrees C outside. Air is drawn into a property through an external monoblock unit, this unit is connected to the internal plumbing system by two insulated pipes running into the property. The air meets with a liquid refrigerant and it’s at this point that the liquid will transform into a gas which is compressed to a high temperature. The indoor unit then transforms this into warm air to heat the property. It’s an extremely efficient process, with air source units being particularly efficient in operating underfloor heating systems. They can, however, also be used to operate radiators and hot water within your home as well as providing cooler air during the summer months. Air-to-Water heat pumps take heat from the outside air and put it through your wet central heating system. This allows for a more complete heating package, including hot water, but may involve the installation of larger radiators or underfloor heating in your home, in order to see the benefits. There are also Air-to-Air pumps which take heat from the outside air and transfer it into your home through fans, but this system will not produce hot water. For more information on our air-to-air range of heat pumps, go to Other. ASHPs are external units which require space around them for air to flow into the unit. If outside space is an issue, an ASHP may not be an option. Planning permission for an external unit may also be required. With listed buildings needing prior consent before installation can begin. The Scottish Government Website can offer more clarity on this. 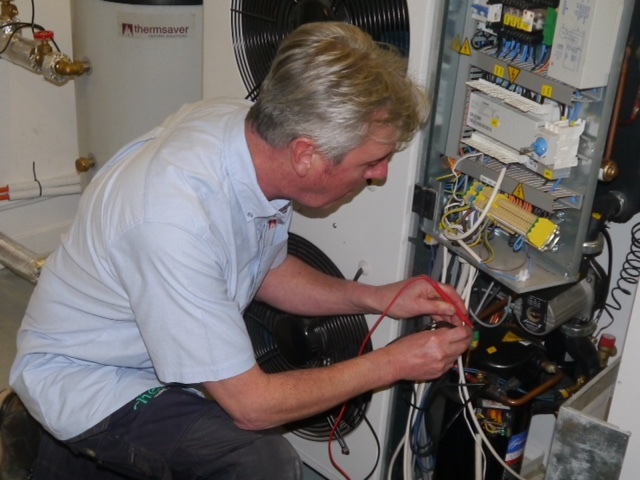 In order for an air source heat pump to be effective, it is important that your home or business is well insulated. ASHPs work best when producing heat at lower temperatures, draught-proofing your home will ensure optimum performance. It is also important to note that heat pumps work at lower temperatures, so in order for the technology to be effective, a key area to consider is the heat emitter design. For example, radiators will need to be made larger and underfloor heating installed at closer centres. In new builds, these considerations usually aren’t an issue, if they’re factored in at an early design stage, but in existing properties these elements can add to the overall cost. Particularly when the heating system and pipe work need to be altered. 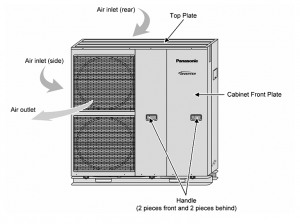 Thermsaver take all of this into consideration in order to give you a fair evaluation of how much the installation of a heat pump would cost. We don’t sell ready-made packages with a ‘one size fits all’ mentality. Instead, we design and tailor packages to the individual needs of clients as we understand that every property is different. Talk to us on 01698 300100 for more details on how we can tailor this renewable heat source to your needs.